Last week’s news story about a local woman’s encounter with a bear while out walking prompted me to consider the responsibility we have in preventing this sort of event, which resulted in the death of the bear. 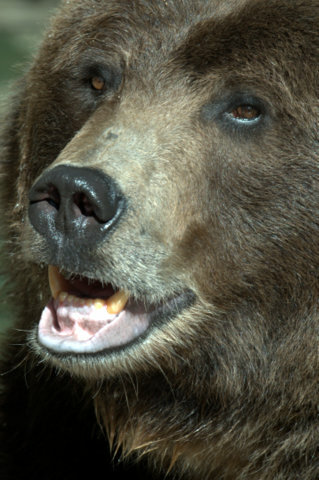 In most cases, bears approach humans because they associate us with food. As one who delights in feeding birds, I’m very aware that what I intend for the birds may also be relished by bears. While bear sightings in my neighborhood are very rare, many neighborhoods along the Front Range extend into bear habitat. We would do well to take precautions. What would happen if you turned on the tap and no water came out? We are accustomed to having water on demand, but here in the west, the truth is that we are slowly running out. As communities grow, increased demand on both surface water and aquifers will eventually lead to rationing and other restrictions. In some places, that has already happened. Since landscapes consume far more water than household use, your yard is the best place to conserve. Lawns are the thirstiest part of most landscapes, so let’s start there. Frequently, homeowners plant turf because they don’t know what else to do, or because they’ve always done it that way. A wall-to-wall carpet of grass might work in Virginia, but is it appropriate in Colorado? They’re jumping up all over the place— miniature flowers with elfin faces, surrounded by petals of yellow and purple. No wonder we call them Johnny Jump-ups! The petite plants, sporting elongated heart-shaped leaves, must have started growing as soon as the ground thawed, to be in bloom this early. These short-lived members of the violet family are not particular about soil, exposure, or water. However, for maximum bloom, grow them in full sun, and don’t let them get too thirsty. Skip the plant food, as too much fertility will encourage leaves at the expense of flowers. For a mid-summer repeat performance, trim back leggy plants. Prolific self-seeders, new plants quickly replace those that succumb to old age, and they will form a solid mat in a year or two. Often used as edging plants, Johnny Jump-ups are perfect naturalized under trees or as a ground cover for spring-blooming bulbs. They also do well in containers. Vegetable seeds will germinate with or without soil. All they really need is an infusion of water to swell the seed coat, and sufficient warmth to signify spring. In fact, seeds for our most commonly grown food crops are among the easiest to start. They will begin their growth on a paper towel, a bed of agar, or even while still inside the fruit where they were formed! The home gardener can put this fertility to good use. Congratulations. You are the proud parent of a tray (or more) of baby plants. Remember, though, with parenting comes responsibility. Once your seedlings are up and growing, they’ll require almost daily attention. If your potting mix did not contain fertilizer, you’ll need to start a feeding schedule. Wait until the first true leaves appear. (The initial “seed leaves” are the cotyledons, which contain plenty of food to get the baby off to a good start.) Use any liquid all-purpose fertilizer at half-strength, twice as often as the directions tell you. And speaking of water, don’t let them dry out! At this stage, wilting is fatal, Even if your plants survive, they will suffer the effects of this trauma all their days. The ultimate crop yield will be smaller, and won’t taste as good, compared to plants that grew unchecked. Continue to water from the bottom, using water that is room temperature or lukewarm. You don’t want to shock their little roots with ice water! If you received a lily for Easter this year, you might be wondering what to do with it once it stops blooming. In warmer parts of the country, you can plant the finished bulb outside. Without being forced to bloom for Easter, the white flowers will appear in July. You’ll be enjoying your “Easter” Lily for many years to come. Unfortunately, in most of Colorado, winters are too severe for these lilies. Unlike other varieties, trumpet lilies are only hardy to USDA zone 6. So, unless you have a very protected spot in your garden, you’ll have to buy a different kind of lily for outdoor growing. To get the most from your gift plant, keep your lily in a cool, bright spot, but not in direct sunlight. Remember to water enough to keep the soil constantly damp, but not soggy. Removing any foil wrapping from around the pot will help excess water drain away from the roots. Author LAHPosted on April 13, 2009 Categories Gardening, Plant ProfilesTags Easter lily, gift plant, houseplant, liliesLeave a comment on Easter Lilies: Now What? If you’ve ever tried growing seeds indoors, you may have ended up with tall and spindly plants, flopping over, adorned with pale leaves. When planted outside, these ungainly wisps quickly succumb to bright sunlight and the gentlest of breezes. What’s a gardener to do? While overabundant food and water, coupled with too-warm temperatures, contribute to this problem, the primary culprit is insufficient light. The crops most commonly grown in our veggie gardens all require full sun—at least eight hours per day. Likewise, bright light is essential for producing stocky seedlings with healthy green leaves.